InSequent is a finalest for Forbes Magazine’s list of America’s Most Promising Companies. We’ve kept a pretty low profile up to now, in 2013 we will raise it. Very excited to have been accepted into the Advanced Management Program (AMP) at Harvard Business School. 2 month immersion/crash course of 16 hour days starting in April. Should be amazing though. Back to my home town of Boston (well Cambridge). InSequent will be in good hands while i am away. These are impressive numbers and if your business is available online you should take note. The article mentions that smart phone users aren’t purchasing yet on their devices, but they will. And InSequent may have something to do with that change in behavior…stay tuned! 4Mads, a small, San Francisco-based adtech startup launched at the beginning of the year, has been acquired by mobile marketer InSequent, whose main product involves the creation of instant mobile websites from existing desktop versions. Terms of the deal were not disclosed, but 4Mads had previously raised over $1 million in funding from angel investors including Roger Lang, Andy Laursen, David Roux, Jon Staenberg and others. With the acquisition, InSequent will now add display advertising to their marketing suite which, in addition to the desktop-to-mobile site conversions, also includes short codes, QR codes, and SMS marketing tools. Previously, 4Mads had targeted small-to-medium sized businesses, who couldn’t afford to hire an ad agency to design their mobile and web advertisements. 4Mads offered an alternative solution, with a DIY toolkit and set of tutorials that allowed these business owners to make their own advertisements. The company claimed it took only 10 minutes or less to build ads on its platform, which also offered over 100 animation effects in both Flash and HTML5, allowing its ads to work on both web and mobile. InSequent, founded in late 2009 by Mark Porter, has partnerships with McClatchy, Digital First Media, Halifax Media Group (formerly the NY Times group), Morris, Deseret, Zenergy, Evening Post Interactive, Guarantee Digital and others. The company is backed by OpenAir Equity Partners and angels including Richard Chino and Jason Fairchild. You can’t help but notice the palpable enthusiasm emanating from comScore today when the analytics and research giant published the latest data from the comScore MobiLens service. 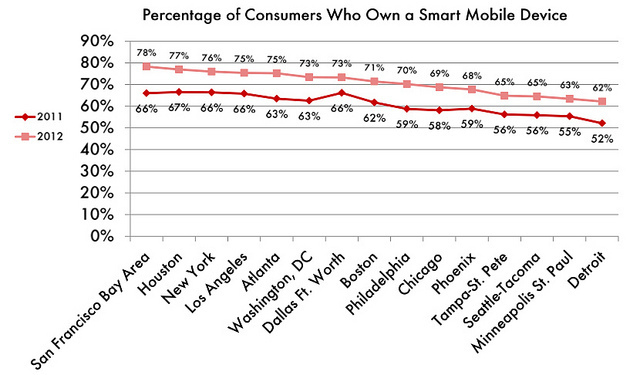 For the three month average period ending September 2012, 119.3 million people in the U.S. owned smartphones. That amounts to 51.0 percent of total mobile market penetration. Once again, Google Android ranked as the top smartphone platform with 52.5 percent market share. That’s up slightly – 0.9 percentage points. Meanwhile, Apple’s share increased 1.9 percentage points to 34.3 percent. Rounding out the other leaders, RIM ranked third with 8.4 percent share, followed by Microsoft at 3.6 percent and Symbian at 0.6 percent. As of the last day of September, 234 million Americans used mobile devices. And device manufacturer Samsung ranked as the top OEM with 26 percent of U.S. mobile subscribers.